Language: Walmajarri JOHN PRINCE SIDDON John Siddon is the son of Pompey Siddon, who was one of the founding painters at Mangkaja Arts Resource Agency in Fitzroy Crossing in 1991. A Walmajarri man, he was born on 15 November 1974 in Derby, and spent his early years working on cattle stations, until injured in a horse riding accident. He now lives in Fitzroy Crossing and is married with a 16 year old son. He paints for Mangkaja Arts, but due to his wifeâ€™s chronic illness and his son having special needs, he has had limited time to develop his art. Asked what started him painting, Prince said there was no single event, but â€œOnce he learnt to paint, he couldnâ€™t stopâ€. He likes action in his art, and enjoys watching animals, waiting for them to come to life in defining moments. His paintings are vignettes of the epic characters of the Narrangkarni (Dreamtime), more modest as they lack the god-like theriomorphism. They are classical, as is revealed by his rendition of traditional hunter gatherers. Prince borrows his narrative formula from the traditional Kimberley craft of boab nut carving, with a touch more menace, or reality. 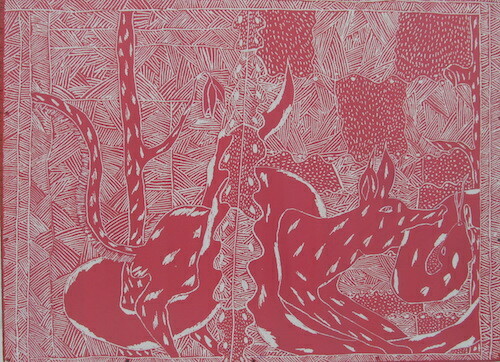 He works in boab nut carving and painting, acrylic paint on canvas, and acrylic on carved wood such as ngurti (coolamons).